President Michel Aoun of the Lebanese Republic addresses the seventy-third session of the United Nations General Assembly. 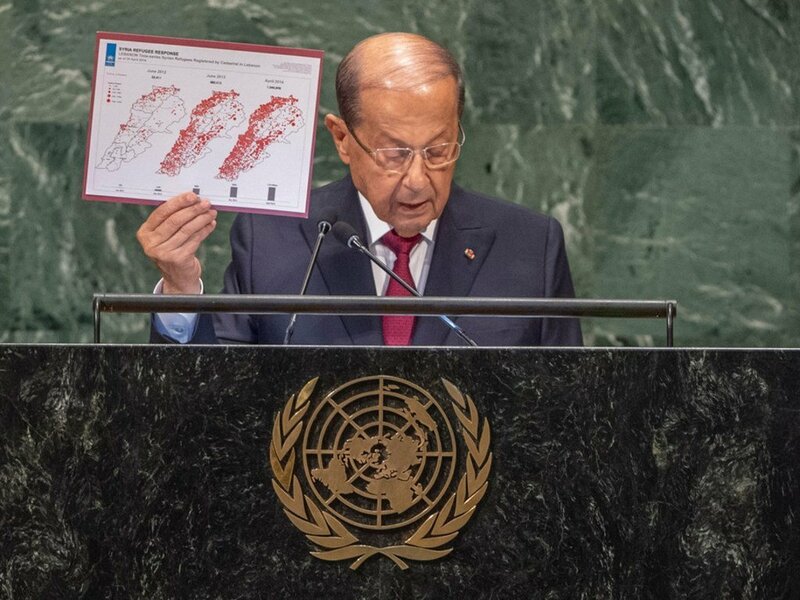 Although Lebanon ‘is groping our way to rise from consecutive crises’, President Michel Aoun said on Wednesday that his country was being buffeted by regional crises and called on the United Nations to show global leadership by taking action to resolve conflicts in the Middle East. As one example, he drew attention to resolution 425 (1978) in which the Council called on Israel to withdraw forces from its territories, saying that 22 years later, due to Lebanese resistance, it was finally implemented. “There must be a reform project that sets out the enlargement of the Security Council, the increase of the number of Member States and the adoption of a more transparent, more democratic and more balanced system,” he underscored. 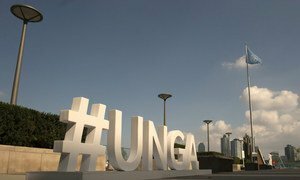 “It is of the paramount importance for the General Assembly to express better the effective orientation of the international community,” he added. Holding up before the Assembly a map provided by the UN refugee agency, he said that there are waves of displaced people “fleeing the hell of war” in Syria pouring into Lebanon, and that while his country has tried to the greatest extent possible to ensure them a dignified and descent life. “Against this background, I reiterate the stance of my country which seeks to consolidate the right of dignified, safe and sustainable return of the displaced to their land, rejecting absolutely any project of settlement, whether for the displaced or the refugee,” he asserted. Observing that the world today suffers from extremism and fanaticism, Lebanon’s Head of State highlighted a pressing need for dialogue between religions, cultures and races, and for building international cultural institutions to spread a dialogue of peace. “The road to salvation resides in convergence, dialogue, the rejection of the language of violence, the establishment of justice between the people, and it is the only path that brings back stability and security to our societies, and achieves the sustainable development that we aspire to,” concluded President Aoun.